The Artym Gallery is pleased to present the work of Rod Charlesworth and David Langevin. Their exhibition opens Saturday June 15th at 10am, and both of these BC artists will be at the gallery from 11am – 3pm that day. Both renowned for their passionate renditions of Canadian landscapes, these two artists have both been painting professionally for decades and are quite well known across Canada, as well as internationally. Artists in attendance for the show opening on Saturday, May 18th. Join us for demonstrations in all three mediums between 11am and 3pm. This exhibition continues until May 26th. Looking for something different? The Artym Gallery is pleased to present a group of new artists for your perusal. Including still life, florals, street scenes and more, the artists featured are all established painters with years of experience with the high caliber of work you expect from the Artym. Be the first to see these new works! The show opens on Saturday, April 20th at 10am. The exhibition continues until April 28th. Join the Artym Gallery Saturday, March 30th at 10am for the opening of this bold show – the black and white pieces will be on display, as well as more typical paintings from participating artists. 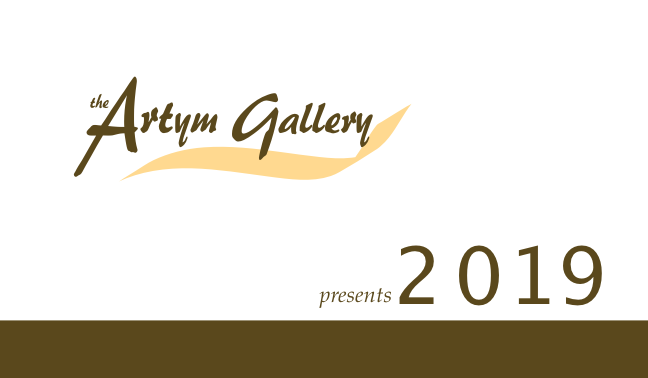 The show continues until April 7th; don’t forget to check out the Artym on Facebook and Twitter, too! A show with original paintings and original jewellery by two BC aritsts. Serge Dube works in acrylic to create his stylized landscapes in a bold palate - they capture the imagination and draw the viewer into a romanticized version of reality. Dietje Hagedoorn will be showcasing her original jewellery designs, as well as bringing loose stones from a recent trip. She will be available for custom design work.